I need some easy dinners in my life right about now! With 2 little ones at home, sometimes it can be hard to get dinner on the table at a decent time. It’s also my passion to feed my family healthy meals that I can make from scratch with whole, fresh foods! 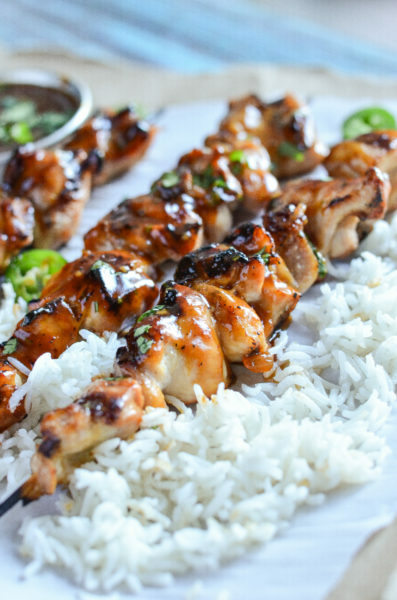 This homemade teriyaki sauce is so easy that you will be making it all the time! Trust me! Now, if you want super easy, you can always use a pre-made, store-bought Teriyaki sauce. Those are great…I just enjoy making my own! …and I like to know exactly what is in my food. I basically started out with a base of soy sauce, honey, and a splash of fresh-squeezed orange juice. After adding a few seasonings, it was perfect. I couldn’t believe how easy it was! I let it simmer on the stove, thicken up, and then brushed it on my kabobs that were fresh off the grill. Perfection! I mean, we are talking restaurant-style Teriyaki chicken served over a bed of basmati rice. Prepare your chicken kabobs by placing your meat and veggies on your skewers. (I alternated with chicken and bell peppers) Onions and pineapples are also good. 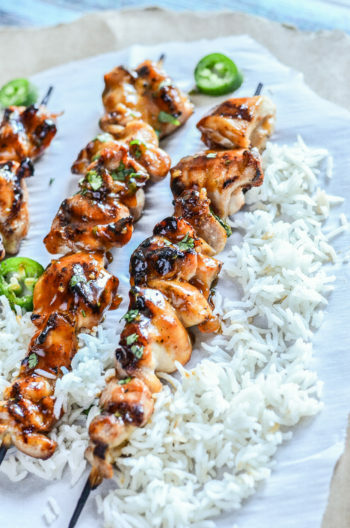 Place your kabobs on the grill and begin to cook. In a sauce pan over low-medium heat, add the soy sauce and orange juice. Mix the corn starch with 1/3 cup cold water and stir until all dissolved. Add the corn starch and water to the soy sauce. Add the remaining ingredients and allow to simmer for 5-10 minutes...until mixture thickens. Brush the Teriyaki sauce on your cooked kabobs right off the grill...be sure to coat all sides. Garnish with chopped green onions and sesame seeds and serve over a bed of rice.